The detection and analysis of hidden radioactive nuclides require a radiation identification tool with high sensitivity and accuracy. 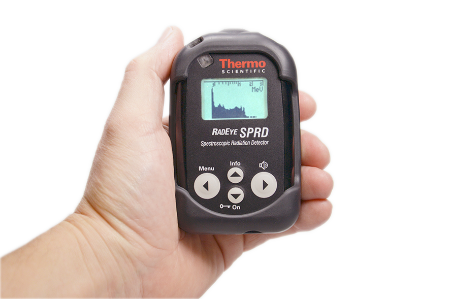 Detect, localize and identify radiation sources generated by manmade devices such as nuclear weapons, improvised nuclear devices (INDs) or radiological dispersal devices (RDDs) with the pager-sized Thermo Scientific™ RadEye™ SPRD Spectroscopic Personal Radiation Detector. The RadEye SPRD detector provides emergency services and law enforcement teams like border guards or special forces with high-performance detection and nuclide analysis for any scenario. The RadEye SPRD is an economic and easy to use Gamma radiation detector that enables it’s user to detect, locate and identify radioactive sources. The capability to perform nuclide identification is added to the advantages of a pager sized personal radiation detector like compact size, low weight and long battery life time. This combination makes the RadEye SPRD detector a perfect tool for those users where the detecting, locating and identifying sources of radiation is a minor requirement of their main task. Like the well known Thermo Scientific™ RadEye™ PRD detector, the RadEye SPRD offers as well the patented Natural Background Rejection (NBR) technology that provides high sensitivity with immediate high selectivity to differentiate between natural and man-made radiation during search and find operation of the device. Once an alarm indicates the presence of a significant radiation contribution, the RadEye SPRD can be put into nuclide identification mode and the source of radiation can be analyzed. Can be used as a search and survey tool as well as for nuclide analysis. Equipped with large, clear graphic display and audible/visible/vibrating alarms; earphone-output for silent alarming. Compliance: Designed to meet ANSI™ 42.48. The RadEye SPRD addresses high sensitivity gamma radiation detection, nuclide identification and dose rate measurement requirements by security forces, steel and recycling industry and first responders. The RadEye SPRD can be worn conveniently placed in its optional holster on the belt of the user. It’s compact size does not interfere with sitting or squatting positions. Radiation alarms can be annunciated by sound, light and/or vibration insuring that the user attention is achieved in all conditions, for example even if the RadEye SPRD is worn in its holster with multiple other equipment at the belt. Therefore the holster is specially designed to make the alarm LED visible at any time. Alarm acknowledgement can be easily performed while the RadEye SPRD is in the holster as well. The according push button is designed to allow altiuation with hand gloves on. Control pads and push buttons are place to allow convenient one-hand operation. Easy to read and understand symbols, menu text or terms are used to display information on the large LCD display.